On Novemebr 8 and 9 North Atlantic Council (NAC) ministerial level meeting was held in the Alliance’s headquarters in Brussels. The meeting was an important step in the process of working out agenda for the 2018 Summit in Brussels. Among issues discussed was the reform of NATO command structure, as well as the future enhancement of Resolute Support mission in Afghanistan. One of the key talking points was an adjustment to the potential invocation of the Article 5 of the NATO Charter – a key aspect in a reality where the military and political climate on the NATO’s Eastern Flank remains tense. Following implementation of the new defence and deterrence measures adopted in the course of the Newport and Warsaw Summits, like established the Very High Readiness Joint Task Force (VJTF) and the Enhanced Forward Presence (EFP) as well as boosted the size of NATO Response Force (NRF), some of the member states noted the increasing need for an improved and more robust command structure, as well as updating the civilian infrastructure in order to better fit the military requirements. The Defence Ministers have agreed to create two new command centers – the Atlantic Command, which will be responsible for securing the sea routes connecting North America and Europe, and an additional logistic command tasked with coordinating and improving movement of troops and equipment across Europe. Both of those capabilities are crucial in the context of NATO’s doctrine of responding to a potential conventional military confrontation, which stipulates that in case of a serious escalation the initial NATO Response Force of roughly forty thousand troops would be joined by the follow on forces, comprised of American assets stationed in the mainland US. However, the redeployment of these units into an active theater would require weeks to complete. This is a problematic situation since the Russian Federation has been perfecting its ability to swiftly mobilize and concentrate large numbers of military assets for years[i]. NATO’s current command structure consists of two strategic commands, and additional 5 tactical and operational centres (see tab. 1). The whereabouts of new command centers are to be discussed during further meetings (with the decision likely going to be announced during the February 2018 ministerial meeting), alongside the matter of facilitating faster and more seamless movement of troops and other assets within the European states. As the NATO Secretary General Jens Stoltenberg stated „Our ability to move forces is essential to deterrence and collective defence (…) but we also need to ensure, that our bridges, culverts, roads and railroads can take the stress of armored vehicles. Bridges need to be high enough to allow taller vehicles to pass under”. 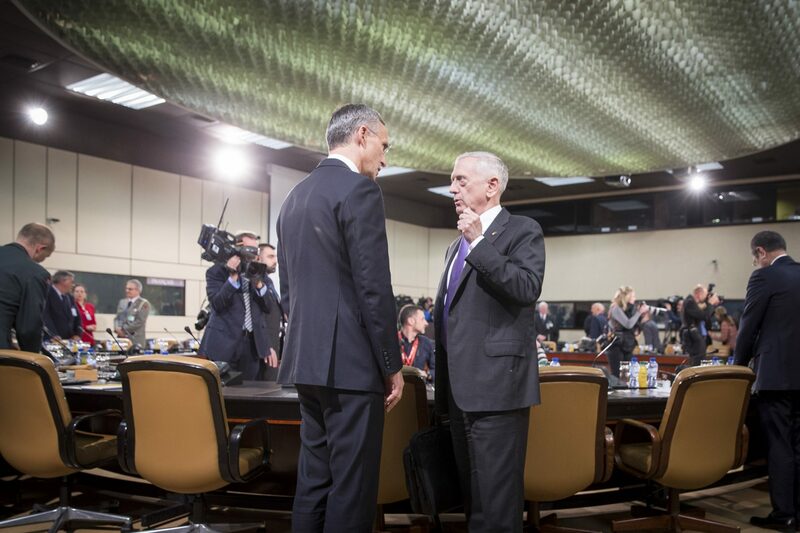 Mr. Stoltenberg’s assessment was that the mobility of military assets could potentially be a area of enhanced cooperation between NATO and the European Union, while the US Secretary of Defense Jim Mattis announced, that the NATO Defence Ministers have reached an agreement regarding the necessity of improving the freedom of movement of the Alliances’ military assets across national borders, which will require adding certain provisions to the member states legal framework. The issue of Russia’s continuous violation of the Intermediate-Range Nuclear Forces (INF) Treaty has also been a subject of discussion during the meeting. As Secretary Mattis stated, the current US Administration is confident that Russia has been guilty of violating the treaty for years now, and the measures that are currently adopted are designed to ensure future Russian compliance with the Treaty. Issue of cyber security has also been touched upon during the Summit, punctuated by the decision to establish a new cyber operations center within the revamped NATO command structure. Lastly, the situation in Afghanistan has also been discussed. At this point in time, NATO alongside its allies (amounting to a total of 39 states) is conducting the Resolute Support mission, which encompasses training the cadre and providing advisory services to the Afghan Armed Forces. Secretary General has also announced increasing the size of NATO contingent by 3000 troops, from 13000 to nearly 16000 troops. The Ministers have furthermore reached an agreed regarding future financial support for Afghan military. The decisions made in the course of the Summit represent the long-term trend of Alliance adapting to emerging conventional threats. The „temporary” elements such as the EFP (extending the duration of the EFP’s mission is going to require political will – despite Mr. Stoltenberg’s reassurances that there are no time limits placed upon it, and that the forces will remain in the theater for as long as necessary) will complement more permanent arrangements, such as the additional command centers as well as improved infrastructural and logistical support and, last but not least, updating the existing legal framework. This attests to NATO’s continuous resolve and consensus among its members regarding the ability to effectively conduct collective defence of its members in case of an armed attack. [i] S. Koziej, Strategiczne wnioski z manewrów Zapad 2017: budowa przez Rosję „bezpiecznika” w neozimnowojennej grze z Zachodem, Pulaski Policy Paper” nr 19, 2017.